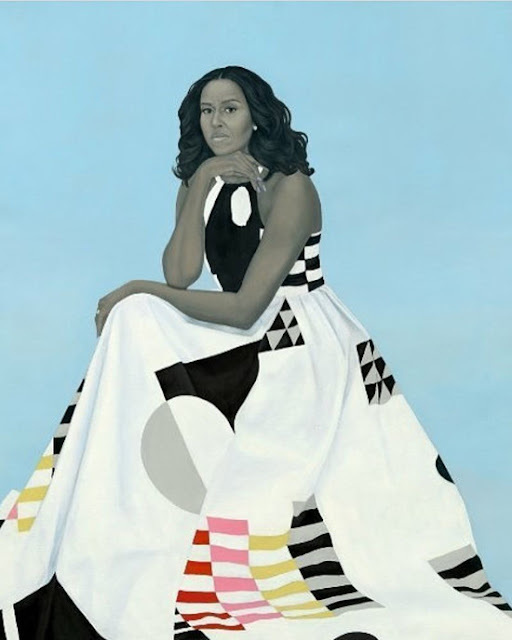 At a ceremony this morning, a portrait of Michelle Obama by Baltimore artist Amy Sherald and a painting by New York artist Kehinde Wiley who was commissioned to paint the official portrait of Barack Obama, were unveiled at the Smithsonian’s National Portrait Gallery in Washington, D.C.
(1) The Obama portraits are horrible. UPDATED: The memes are simply to good to pass up. My take on the Obamas official portrait. Like pomo philosophy itself, both portraits are two dimensional, lacking depth. 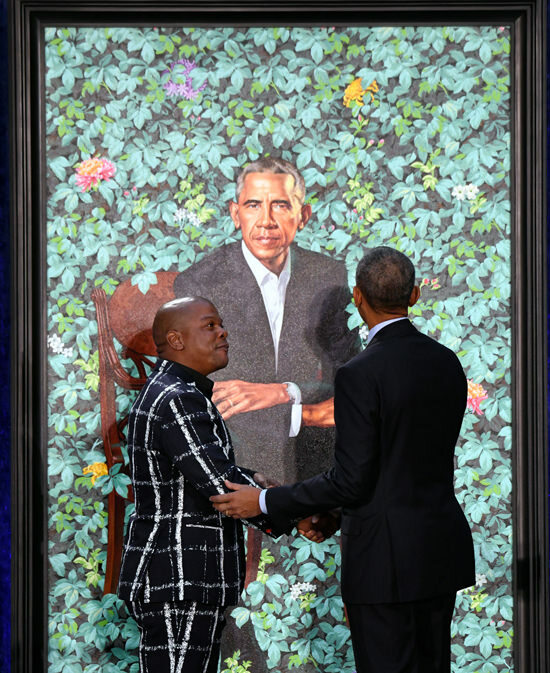 Artist Kehinde Wiley, known for large, colorful paintings of African-American subjects, painted the former president’s portrait, which will be displayed in the museum’s America’s Presidents exhibition. 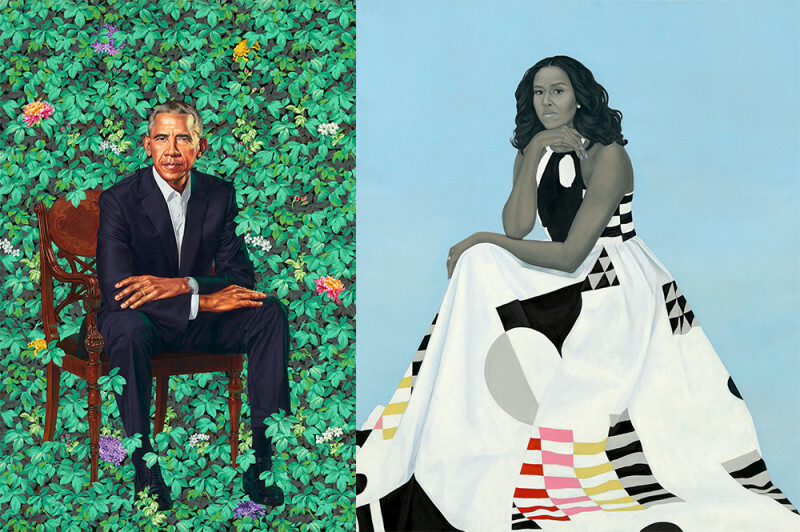 The seven-foot portrait features a background of flowers, including chrysanthemums, the official flower of the Obamas’ hometown of Chicago; jasmine, for Hawaii, where Obama spent his childhood; and African blue lilies to reference his late Kenyan father. Seven-foot portrait of Barack Obama featuring a background of flowers. Amy Sherald, who painted Michelle Obama’s portrait, who was the first woman to win the National Portrait Gallery’s Outwin Boochever Portrait Competition, is known for conveying “the inner strength of her subjects through a combination of calm expressions and confrontational poses,” the Smithsonian noted. Her portrait of the former first lady features gray skin tones that are a distinctive aspect of a majority of her paintings. Michelle Obama is wearing a dress by designer Michelle Smith’s label Milly, and the geometric colors were inspired by Piet Mondrian. Michelle Obama wearing a dress by designer Michelle Smith, geometric pattern inspired by Piet Mondrian. Halliburton House, Inspiration For "The Fountainhead"